(Nanowerk News) Doppler measurements that help track storms on Earth may also be useful for understanding storms on the sun. A Rice University astrophysicist is part of an international team that combined Doppler techniques with images and data from a space-based telescope to observe, for the first time, loops of 1,800,000-degree Fahrenheit plasma flowing up from the sun’s surface at more than 12 miles per second. The loops, rooted in active regions near sunspots and guided by the sun’s magnetic field, arch over the sun and may be the first signs of trouble spots, where plasma undergoes “impulsive heating,” according to the researchers. They expect their findings will help scientists understand the genesis of solar flares and coronal mass ejections – solar storms – that threaten satellites orbiting Earth and power transmission grids on the ground. Rice’s Stephen Bradshaw and colleagues in India and the United Kingdom reported their results today in the Astrophysical Journal Letters ("Observations of Plasma Upflow in a Warm Loop with Hinode/EIS"). 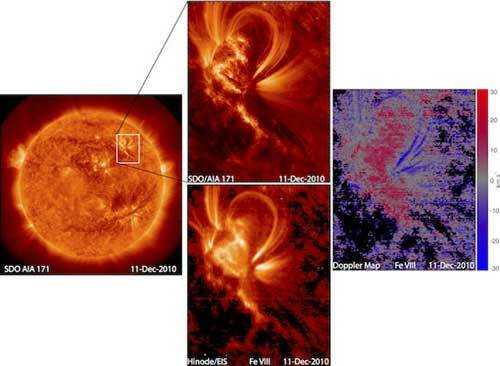 They wrote that Doppler measurements drawn from images taken by the Extreme-ultraviolet Imaging Spectrometer (EIS) aboard the Hinode solar satellite show the first observation of a “warm loop” in which plasma rises from the surface of the sun rather than sinks back into it. In visible-light Doppler, objects moving away from the viewer are shifted red, while objects moving closer shift blue. That fact has long been useful to astrophysicists judging how fast other stars and even galaxies are moving in an expanding universe. But in previous observations of active regions on the sun, warm loops like the one observed by Bradshaw and his colleagues have only been seen to shift red and, therefore, the plasma was thought to be sinking. The prevalence of red shifts led to the belief that heating is taking place high in the sun’s atmosphere and leading to the evaporation of material from near the surface into the atmosphere that then flows back down as it cools. That may be true, Bradshaw said, but it leaves some important questions unanswered: What causes the heating? Where is the evidence for plasma rising from the surface into the atmosphere? The new observations will help to answer these questions, he said. Bradshaw noted the sun is fast approaching the part of its 11-year cycle when flares and coronal mass ejections occur most frequently. “These events present the most danger to satellites, power grids and even to airliners on flight paths in polar regions,” Bradshaw said. “This period is called solar maximum, and we will become ever more reliant on this technology during every subsequent solar cycle. “One of the aims of solar research is to develop a space-weather forecasting capability, whereby solar storms can be predicted by detecting their signatures before they occur at the sun,” he said. “This is much like monitoring depressions as precursors to tropical storms and hurricanes, but space-weather forecasters will monitor active regions. Accurate forecasts of solar storms will give us the maximum possible time to prepare for their arrival at Earth and to mitigate their effects. Co-authors are principal investigator Durgesh Tripathi ofthe Inter-University Centre for Astronomy and Astrophysics in Ganeshkhind, India; and Helen Mason, assistant director of research, and Giulio Del Zanna, an advanced fellow in the atomic astrophysics group, both in the Department of Applied Mathematics and Theoretical Physics at the University of Cambridge. The Hinode satellite was launched in 2006 by the of Space and Astronautical Science and the Japan Aerospace Exploration Agency, in collaboration with the National Astronomical Observatory of Japan, NASA and the and Technology Facilities Council the United Kingdom. The European Space Agency and Norwegian Space Centre also supported the research.